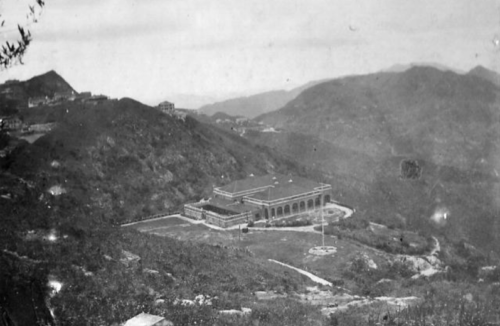 Dodwell & Co. (天祥洋行) or Dodwell’s, was one of the leading British merchant firms, or hongs, active in Hong Kong, China and Japan during the 19th and 20th century. It was a direct rival to Jardine, Matheson & Co., Dent & Co., and Russell & Co. Swire oulived the latter two and remains a major commercial power in Hong Kong, China and the region. This article was written by Robert Nield, and first published in the Dictionary of Hong Kong Biography, edited by May Holdsworth and Christoher Munn. The publisher, HK University Press, has kindly granted permission for it to be posted here. Thanks to SCT for proofreading the retyped article. George Dodwell went to Shanghai in 1872 to join Adamson, Bell & Co. as a shipping clerk. An exporter mainly of tea and raw silk, Adamson, Bell & Co. provided good conditions of service and in due course allocated Dodwell a small percentage of the annual profits, in particular profits earned on its freight shipping business, which Dodwell had built up. 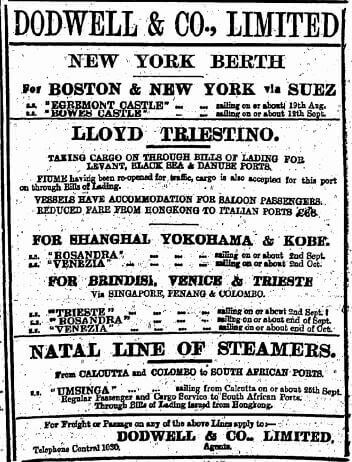 Quick to take advantage of new steamship routes to America, Dodwell organised the first regular steamship service across the Pacific in 1887. When the firm was dissolved in 1891, Dodwell and his friend John Hepburn Carlill took over the bankrupt business and operated for some years together as Dodwell, Carlill & Co. In 1898 this partnership was reorganised into a limited liability corporation under the name ‘Dodwell & Co. Ltd’. Dodwell & Co. achieved rapid success as an import, export and shipping firm, with its main offices in Hong Kong and London. Dodwell and his wife Julia had two sons and four daughters. The family lived in ‘La Hacienda’ on Mount Kellett. Dodwell was a man of high principle and sang for many years in the choir at St John’s Cathedral. 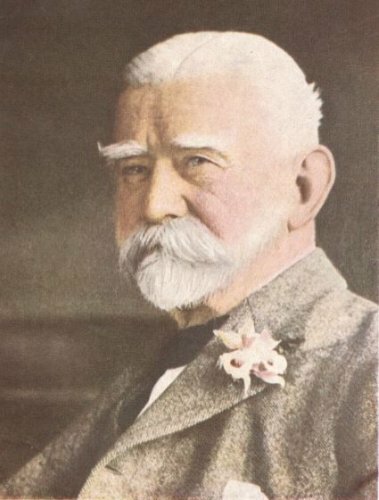 He returned to London in 1898 to take charge of the new firm’s head office but maintained an active interest in its China operations, visiting Hong Kong periodically. By the time of his death in 1925 the firm had established itself as one of the great hongs: besides its offices in London and Hong Kong it had branches throughout China, and in Colombo, Tokyo, Yokohama, Kobe, Vancouver, Seattle, San Francisco, New York, Savannah, and Antwerp. It was probably the largest single shipping firm on the Pacific coast of America by the early 20th century. After G.B.Dodwell’s death his sons George Melville and L.S.G. Dodwell continued to lead the firm’s Hong Kong office. This article was first posted on 21st March 2018.